Leslie Kielson began making Battenkill Brittle in Southern Vermont in the summer of 2010. Always in search of an energy bar that tasted good but didn’t weigh you down, she started experimenting. After countless hours experimenting and testing out different recipes, a prototype was created. She and her partner took this experiment on a 7-day bicycle trip through northern Vermont and were amazed at how just a small amount powered them up the many Vermont hills. Afterwards, friends and family were clamoring for more and hence, Battenkill Brittle was born. Leslie lives in southern Vermont with her partner, their dog, cat, and 3 sheep. Quite a change from her life in New York City where she lived for 8 years and was a political organizer working to end the war in Iraq. But while she loved city life for a while, she was very happy to get back to the country where she could grow her own food and now also produce good, healthy food for others. 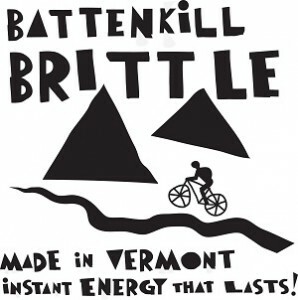 Battenkill Brittle… Instant Energy That Lasts! Battenkill Brittle is made with organic sunflower seeds, organic sesame seeds, organic pumpkin seeds, organic brown rice syrup, pure Vermont maple syrup and pecan meal. Battenkill Brittle is a high energy snack and Crumble is the perfect addition to yogurt, oatmeal, waffles and salads. It is packed with nutrition and provides sustaining energy for any kind of physical activity, as a snack for students, or a pick-me-up at the office.